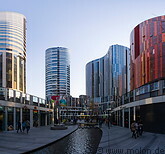 Sanlitun (三里屯 in Chinese) is located in Chaoyang, a district west of the Forbidden City not far from the Guomao area. 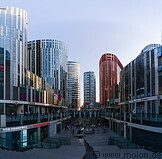 Sanlitun includes the Taikoo Li shopping area in the north, which is full of modern and sophisticated buildings and houses many stores and shops. South of the Gongren Tiyuchang road lies the SOHO compound, with several sophisticated office, commercial and residential towers. Here there are many cafes and restaurants. Skateboarders meet in the central round square in the SOHO complex. Sanlitun attracts a young and hip crowd and many foreign tourists, due to its shopping opportunities and nightlife.